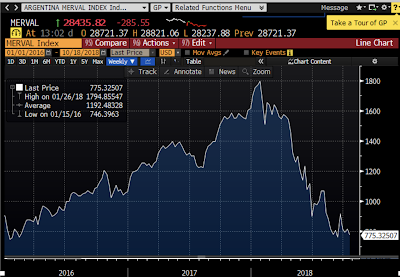 A few weeks ago I opined that the sudden equity selloff was just another panic attack, and unlikely the start of a major rout or a harbinger of another recession. It's now turned into an official correction, with the S&P 500 down 10% from last month's peak. Has anything changed to make the prognosis worse? 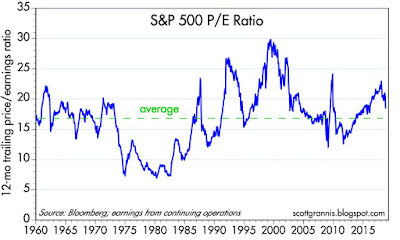 Lots of things have changed, mainly equity valuations (which have improved significantly), but the underlying fundamentals are still healthy and therefore at odds with the market's apparent level of distress. Nine months ago (January 26th) the market was enthusiastic: the PE ratio of the S&P 500 (using Bloomberg's measure which counts only profits from ongoing operations) was just over 23. 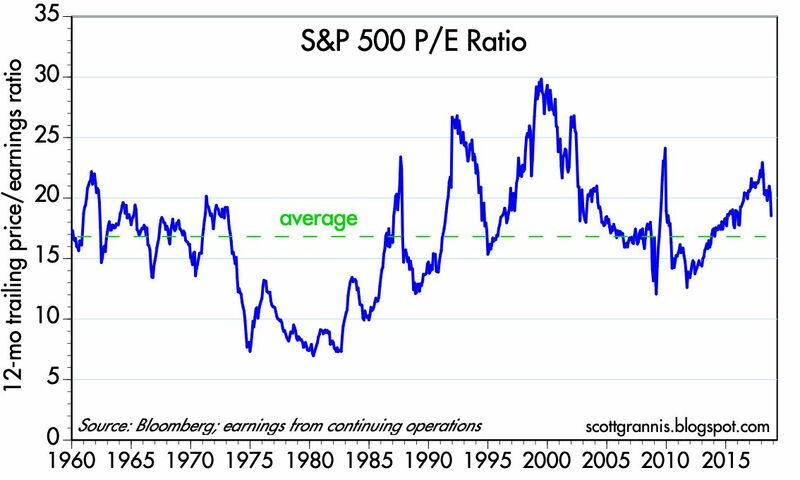 Today, despite the fact that profits have since risen almost 16%, that same PE ratio has fallen over 20% and now stands at 18.5. That's quite remarkable, considering the market currently expects profits to grow by another 25% over the next 12 months, which would imply a forward PE ratio of a mere 14.7, significantly below the market's long-term average of just under 17 (see charts below). 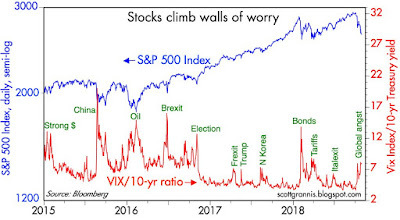 In short, the market has gone from enthusiastic to very worried in a relatively short time frame. To judge from these metrics, while a recession seems very unlikely in the next year, beyond that the market appears to have lost all confidence. The causes of this dramatic turn of events are many, and I'm now going to sum them up as "global angst:" a weakening Chinese economy, budding tariff wars, concerns about Fed tightening, a fragile Eurozone, weakening emerging market economies, rising oil prices, and all coupled with the fact that we are entering the 10th year of an economic expansion (which by itself makes investors quite nervous—how much longer can the good times last?). None of these factors have appeared out of the blue however; they've all been headwinds for awhile, but it seems they have rather suddenly combined into something like a perfect storm. Equity valuations have plunged, but it's hard to find any evidence of a sudden or imminent economic downturn. In fact, financial market and economic fundamentals remain solid: swap spreads are low (which implies low systemic risk and abundant liquidity), credit spreads are up only slightly from relatively low levels, the yield curve is still positively sloped and real yields are still relatively low (which together imply that the Fed is far from being tight), the dollar is reasonably strong, and inflation expectations are reasonably anchored. The Powell Fed has given no hint of being willing to ignore the market's sudden distress in pursuit of an aggressive tightening agenda, and I seriously doubt they would do so anytime soon. So it seems this is still in the nature of a panic attack, and as such it should pass. But of course there are events that can pop up that are unpredictable, and investors must always shoulder the burden of the unforeseen. If you can't take that heat, you shouldn't be in the market. 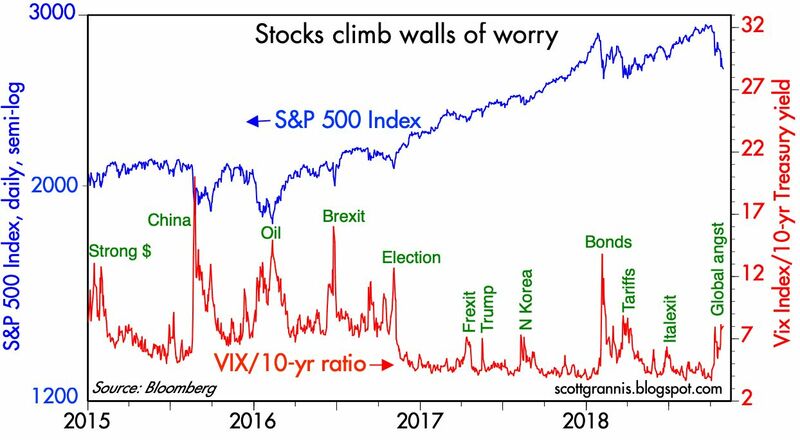 Chart #1 illustrates how all of the market selloffs in recent years have been accompanied by a sharp rise in "worries." For "worries" I use the Vix index divided by the 10-yr Treasury yield. The Vix index rises as fear rises, while the 10-yr Treasury yield tends to rise as confidence in the economy rises. 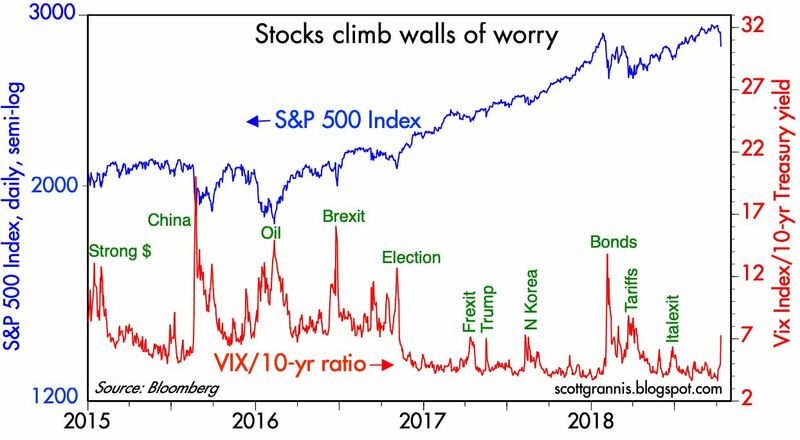 We've seen much more serious levels of worry in recent years than we see now. Chart #2 shows that swap spreads, which are a key coincident and leading indicator of financial market and economic health, remain relatively low. 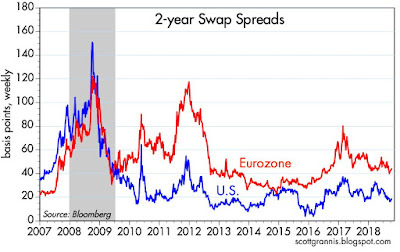 At 20 bps, US swap spreads are fully consistent with healthy and liquid financial markets. At the same time they tell us that systemic risk is low. Liquid financial markets are a sine qua non for a healthy economy. No problem here. 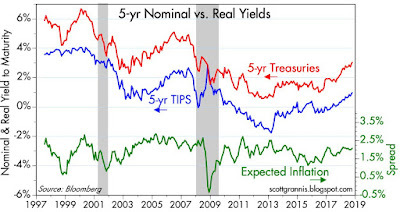 Chart #3 shows the level of real and nominal 5-yr Treasury yields and the difference between the two, which is the market's expected annual inflation rate over the next 5 years. Inflation expectations today are very close to the Fed's 2% target. No problem here. 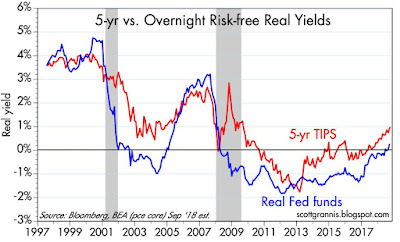 Chart #4 compares the level of 5-yr real TIPS yields with the real Fed funds rate. 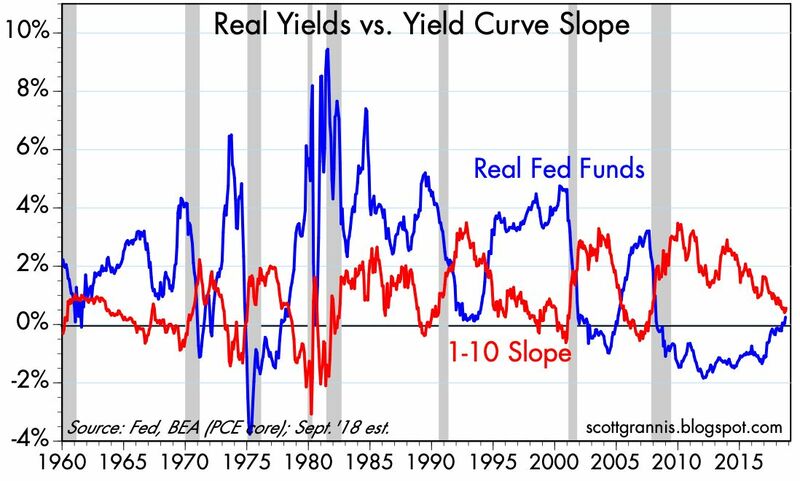 This tells us that the real yield curve is positively sloped, and the market is not concerned that the Fed has tightened too much. 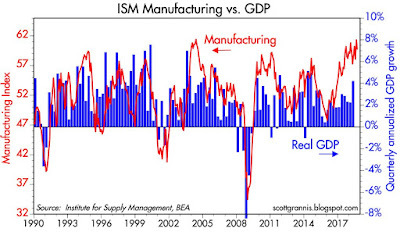 The time to worry is when the blue line exceeds the red line, as that would be an indication that monetary policy was too tight and the Fed would likely be force to cut rates in the future. That's not the case today. At worst, the bond market is telling us that perhaps the Fed will need to move rates up more cautiously in the future. That's not a problem. 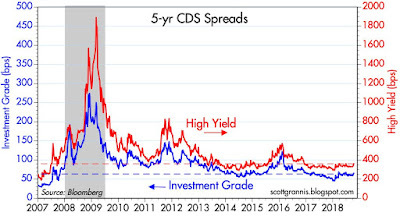 Chart #5 shows 5-yr Credit Default Swap Spreads. 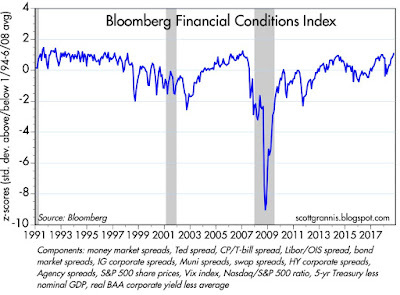 These are highly liquid and generic indicators of the market's confidence in the outlook for corporate profits. 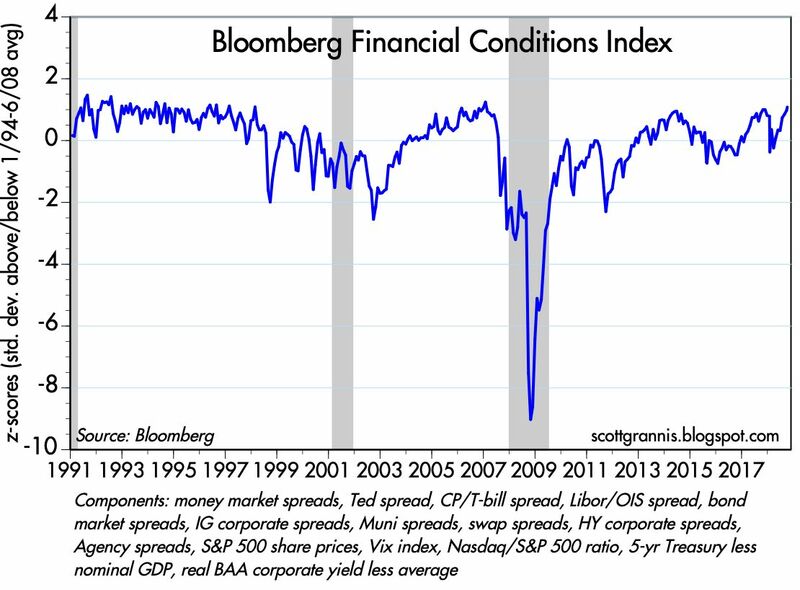 These spreads have increased only modestly despite the sharp equity selloff, which further suggests the market is still confident in the outlook for corporate profits and the health of the economy. No obvious problem here. 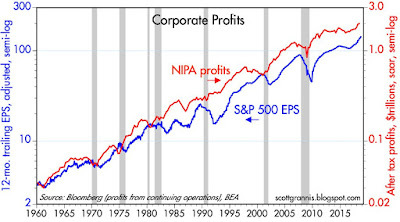 Chart #6 shows Bloomberg's measure of the S&P 500's PE ratio, which uses profits from continuing operations. Since January of this year PE ratios have plunged rom 23.3 to now 18.5 (-20%). 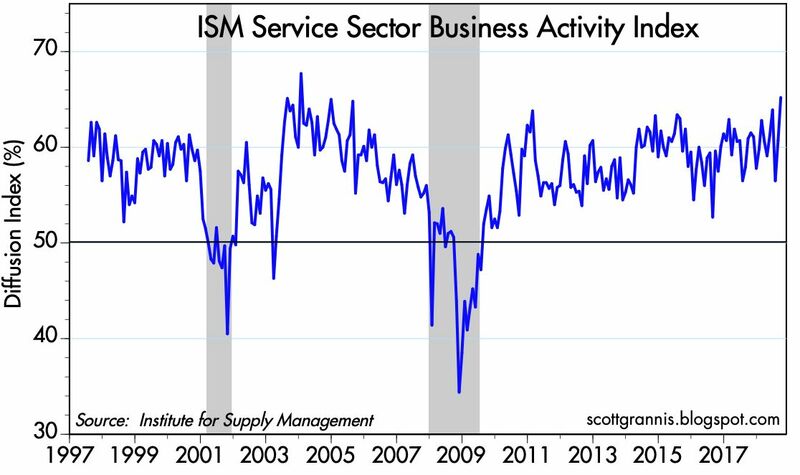 This reflects a rather sudden loss of confidence in the long-term outlook, especially considering that profits continue to rise. 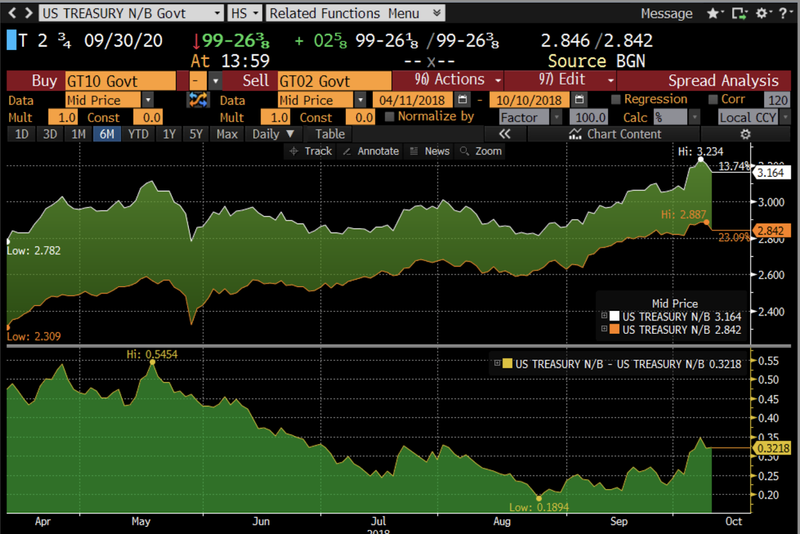 Curiously, the bond market appear to be much more confident about the future than the stock market, given the low level of swap and credit spreads. 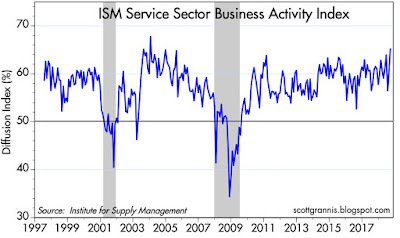 This further suggests the equity market may just be in the throes of a panic attack. 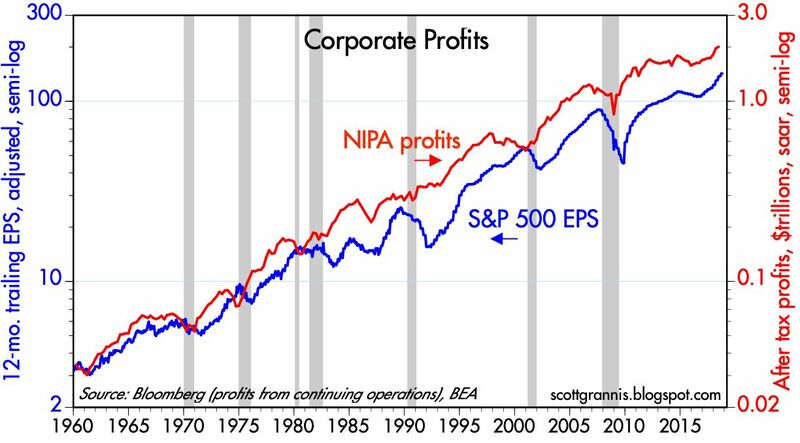 Chart #7 compares two measures of corporate profits: after-tax corporate profits as calculated in the National Income and Product Accounts (red line), and after-tax earnings per share based on a 12-month trailing average of reported quarterly earnings. Both are at all-time highs and rising. No problems here. 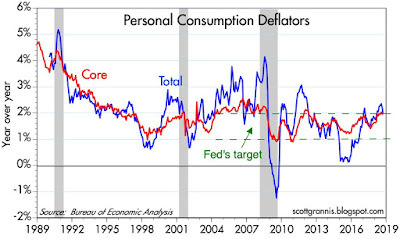 Chart #8 shows the Fed's preferred measures of inflation, based on a broad measure of personal consumption. 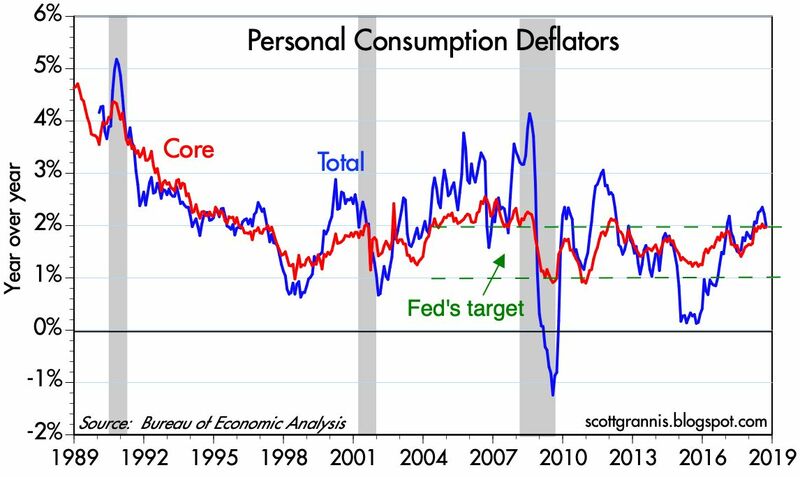 Both total and core inflation are very close to the Fed's 2% target. No problem here. Chart #9 compares the real Fed funds rate (a good measure of how loose or tight monetary policy is) with the slope of the Treasury yield curve. Recessions have always been preceded by a substantial tightening of monetary policy and a flattening or inversion of the yield curve. We're a long way from those two conditions today. 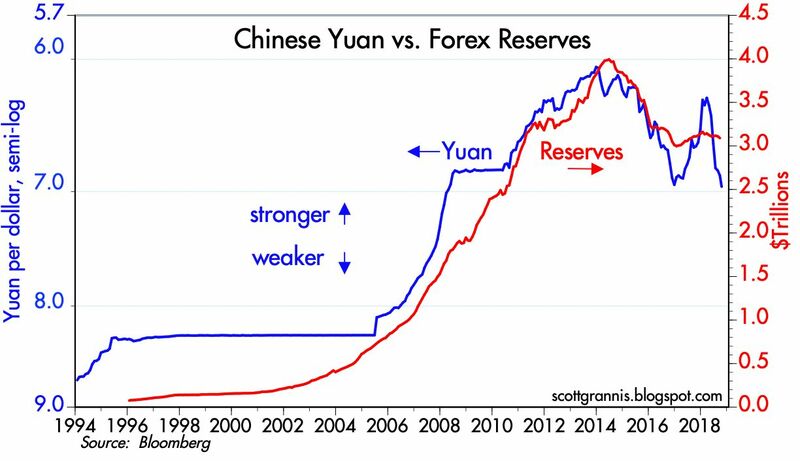 China has taken a beating in recent years, and especially this year, which has seen the steepest-ever drop in the value of the yuan. 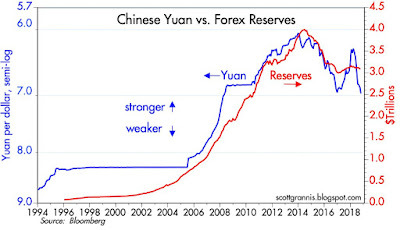 This has occurred in tandem with a decline in the Chinese central bank's holdings of foreign exchange reserves, and both are symptomatic of capital flight. Capital is leaving China because investors are worried about the future of the Chinese economy. In a relative sense that's good for us, but if China were to fall off a cliff, well, that would not be good. China is the biggest concern in the world right now, but their leadership could fix that problem by simply acquiescing to Trump's (and the WTO's) demands: respect intellectual property rights, and reduce or eliminate tariffs and subsidies. In short, China's outlook would improve dramatically if they simply adopted sensible policies. How hard is that? 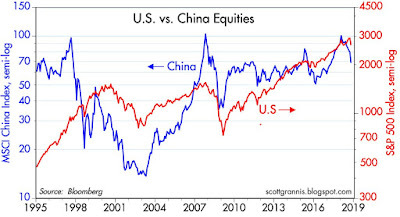 Chart #11 compares the Chinese and US stock markets. Note that both y-axes have the same ratio between top and bottom values (15x), and both use a semi-log scale. China's stock market has truly plunged since January of this year, suffering a punishing loss of almost one-third of its value. 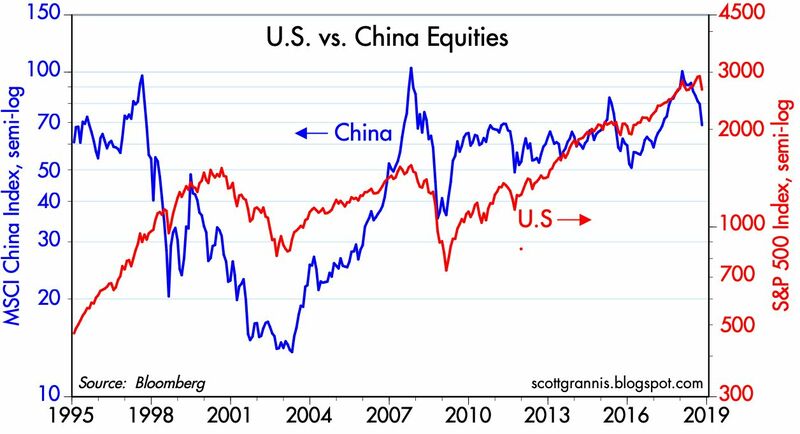 Worse still, China's stock market today is trading at close to the same level as it was over 20 years ago, whereas the US market has risen 460% over the same period. Big problem for China. Free market-style reforms could do wonders for China's wealth. What's good for China would be very good for the rest of the world. 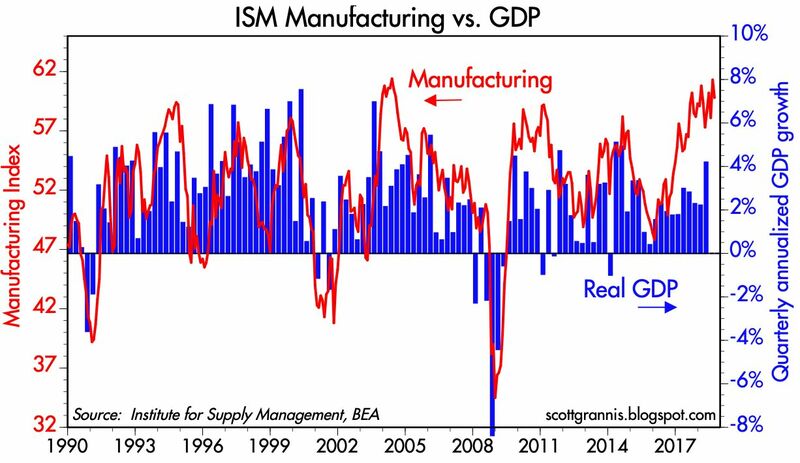 What stands out in all of this is that equity market fears are not supported by any deterioration in the economic and financial fundamentals, at least in the U.S. economy. That could always change for the worse, but for now it's still in the realm of speculation. 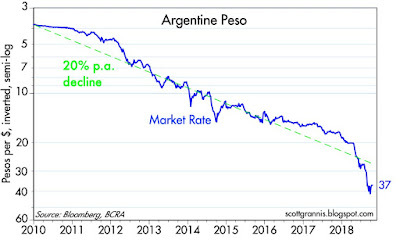 Four months ago I proposed "A simple fix for Argentina's peso." Late last month, after some much-needed changes in leadership, the central bank announced an agreement with the IMF in which they proposed to do exactly as I recommended: sharply curtail future money printing. In fact, the central bank vowed to deliver zero growth in the money supply over the next year. Wow. Milton Friedman would be jumping for joy. In dollar terms, the value of the Argentine stock market has plunged 57% since its January '18 high, but it has been relatively stable for the past two months. The economy is in recession, and discontent with the Macri administration is rampant. There's no assurance things will hold together for another 11 months. How will the government borrow what is needed to fund its deficit (3-4% of GDP) if it can't ask the central bank for free money? Only time will tell. But if the central bank can maintain its resolve for a few more months, a surge of confidence could produce a wave of foreign capital inflows more than sufficient to do the job. There is hope. Chart #1 shows the level of Argentina's foreign exchange reserves. They surged by almost $30 billion following the late-2015 election of President Mauricio Macri, and were further boosted by about $8 billion thanks to the successful sale of bonds earlier this year. But beginning last April, the central proceded to squander some $30 billion (including monies received as the result of an IMF loan), in a futile attempt to "defend" the peso against massive capital outflows that were sparked by a terribly foolish tax on foreign capital (see the post linked above for more detail). In reality, the central bank simply accommodated capital flight, since the supply of pesos continued to surge. (In technical terms this is called "sterilized intervention.") Very foolish. 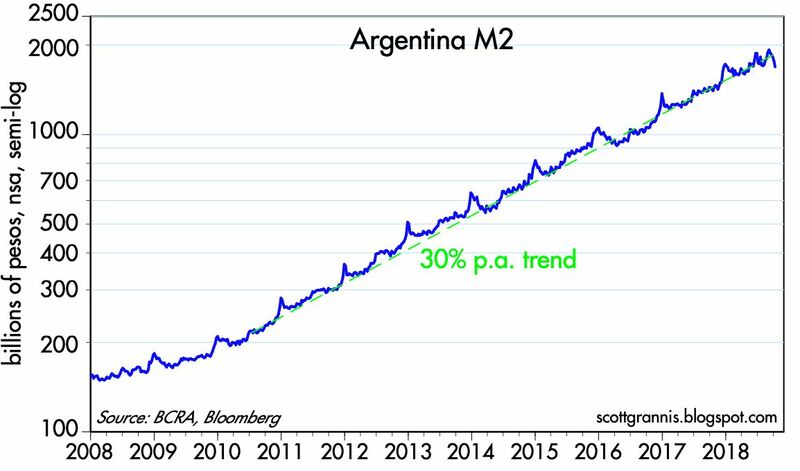 Chart #2 shows the level of Argentina's M2 money supply, which grew at a roughly 30% annual pace from early 2010 until recently. 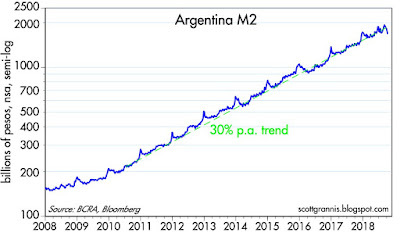 In relative terms, Argentina's money supply expanded by about 25% more every year than did our M2. 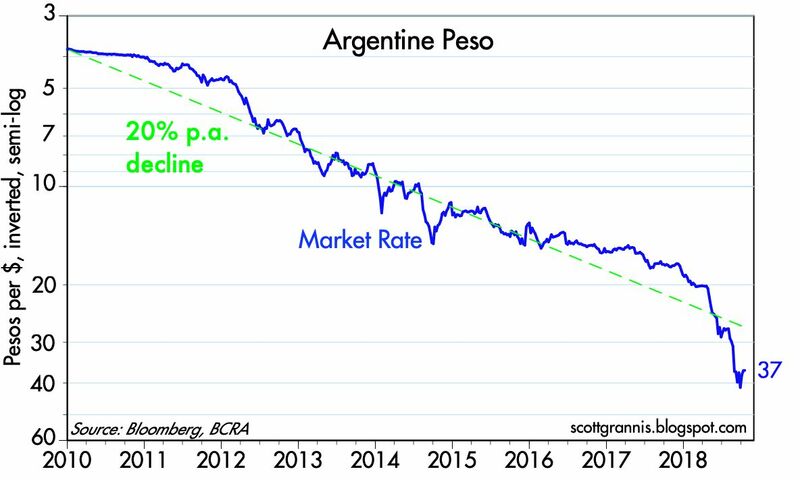 In theory, much more rapid growth in Argentina's money supply should have resulted in a roughly 20% annual decline in the value of the peso. Chart #3 illustrates this (green line). 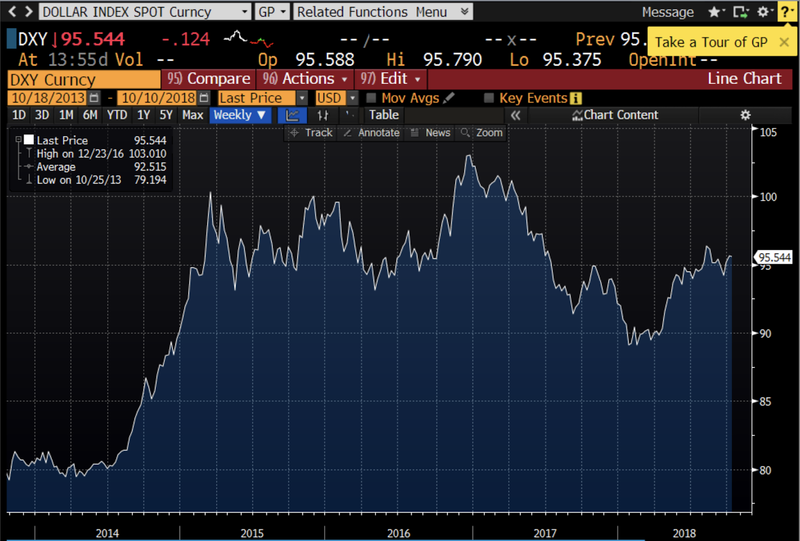 Note that in recent months the peso fell by much more than would be suggested by its rate of monetary expansion: this is a measure of the panic selling that typically precedes periods of consolidation. With the peso at extremely cheap levels, the market was ripe for a positive shock, which the central bank fortunately was able to deliver in the form of a "no more money printing" pledge. Chart #4 shows the dollar value of Argentina's Merval (stock market), which has plunged by 57% since early this year. 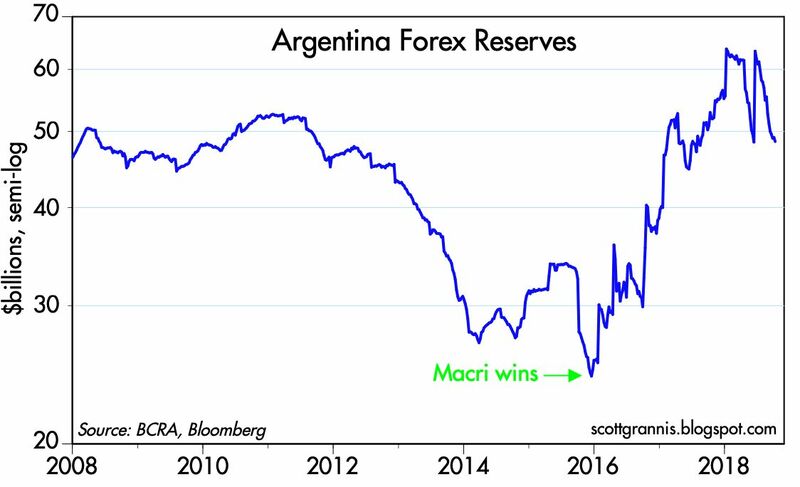 All the gains that accompanied the election of Macri and the subsequent massive capital inflows have been reversed. 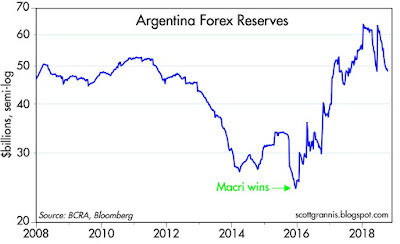 If Macri and his new central bank leadership team can stay the course, the upside potential of this struggling emerging market economy is HUGE. The S&P 500 has lost about 5% since last month's record high, but it's still up about 4% year to date. It's painful, but still short of a typical correction (-10%). The culprit? News reports cite the 80 bps rise in 10-yr bond yields this year, Fed tightening, rising tariffs, and the flatter yield curve. I don't buy most of that. Bond yields are still unusually low, and the driver of higher yields is rising real yields, which reflect a stronger economy; why should a stronger economy be bad for stocks? 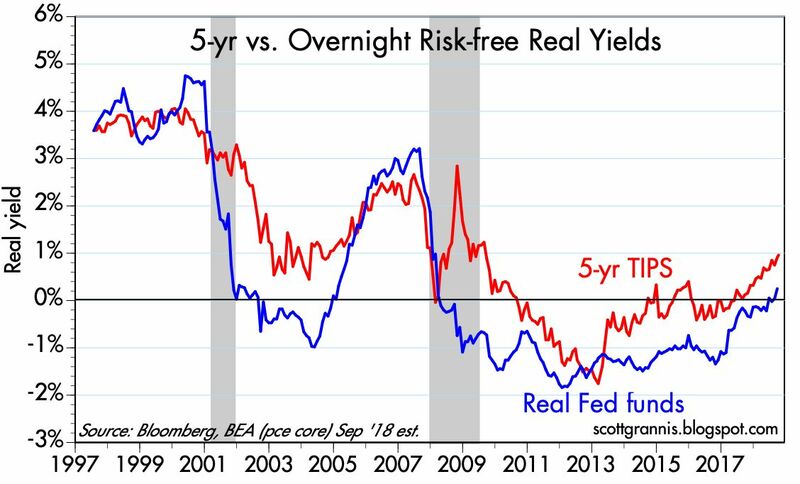 The Fed hasn't even begun to tighten, since the real Fed funds rate is only slightly above zero; short-term borrowing costs are almost free. The yield curve has flattened, but it is still positively sloped; the all-important real yield curve is still nicely positive—no implied threat there. Rising tariffs are a genuine problem, to be sure, but that's still in the nature of a headwind rather than impending doom. Tariffs can be dismantled as fast as they are applied, and Trump has made good—if hardly perfect—progress bringing down tariffs with Canada, Mexico, and the Eurozone. China is the main problem, and it boils down to a big game of tariff chicken. It's in no one's interest to escalate this conflict to outright tariff wars. I remain confident that the future of global trade will be "freer and fairer." The truth about tariffs is that a) they mainly hurt the country that applies them, and b) lower tariffs are always better for all concerned. I'm not ready to bet that Trump and China will refuse to come to an agreement that would be mutually beneficial. Right now, my best guess is that this is just another panic attack, of which we've had quite a few in recent years. 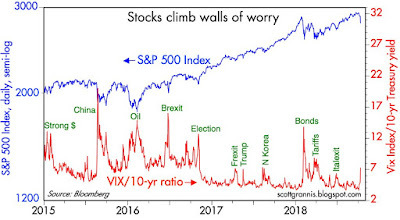 They've all been resolved eventually, as the stock market manages to climb successive walls of worry. This is healthy. It wouldn't be surprising to see prices decline further, but it would be surprising if this proved to be the beginning of a major rout or recession. The Vix index is the classic measure of investor's fears; the higher it is the more it costs to buy the protection of options. I like to divide it by the 10-yr Treasury yield, since that is a proxy for the market's growth expectations; the higher the yield, the stronger the economy, and vice versa. The ratio of the two is thus a measure of how fearful and doubtful the market is about the future. It jumped today, but as Chart #1 shows, it is a minor blip from an historical perspective. Note how jumps in the Vix/10-yr ratio always coincide with big drops in equity prices. 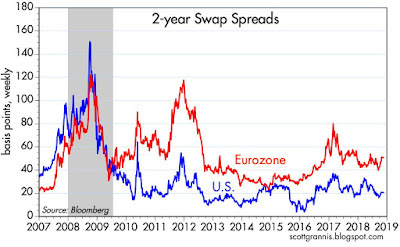 Chart #2 shows 2-yr swap spreads in the US and Eurozone. Swap spreads are an absolutely key measure of market liquidity and systemic risk (the lower the better). 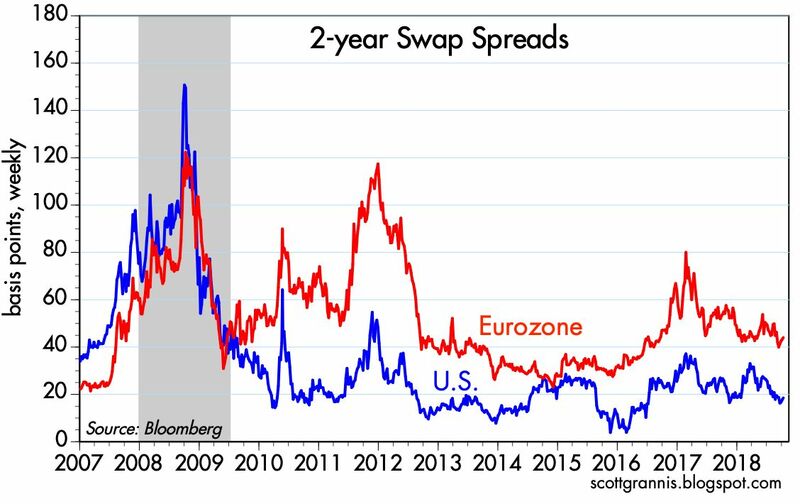 Swap spreads also have proven to be excellent leading and coincident indicators of financial market and economic health. 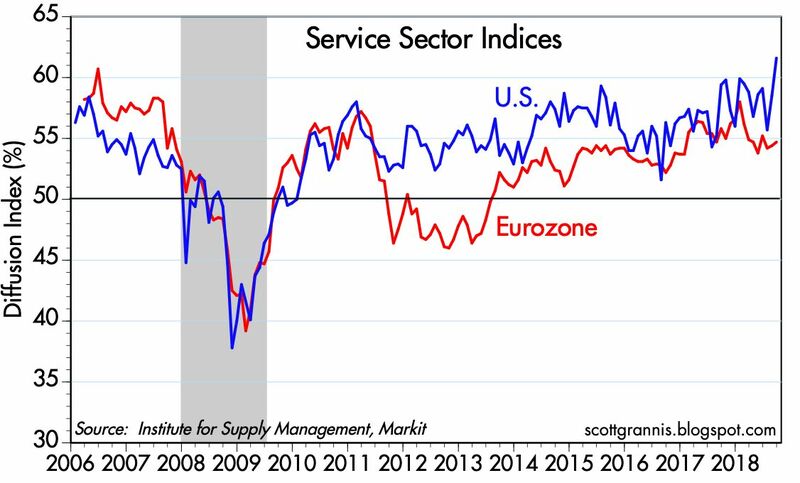 Conditions in the Eurozone aren't quite as good as they are here, but conditions in the US are about as good as they get. There is plenty of liquidity, which is essential to ensure orderly markets. With plentiful liquidity, the market can price in and deal with all sorts of problems. Problems arise when liquidity is scarce and markets are thus unable to perform one of their key functions, which is to distribute risk from those who don't want it to those who do. 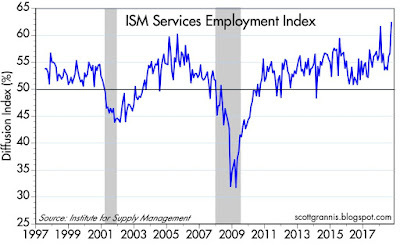 This chart is also prima facie evidence that the Fed is NOT tightening monetary policy. 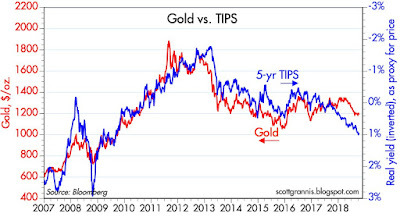 Chart #3 compares the prices of gold and 5-yr TIPS (using the inverse of their real yield as a proxy for their price). It's remarkable that the prices of these two distinct assets should tend to move together. Both have been in a gentle downtrend for the past several years. I've interpreted that to mean that market is gradually losing the risk aversion that peaked about six years ago. 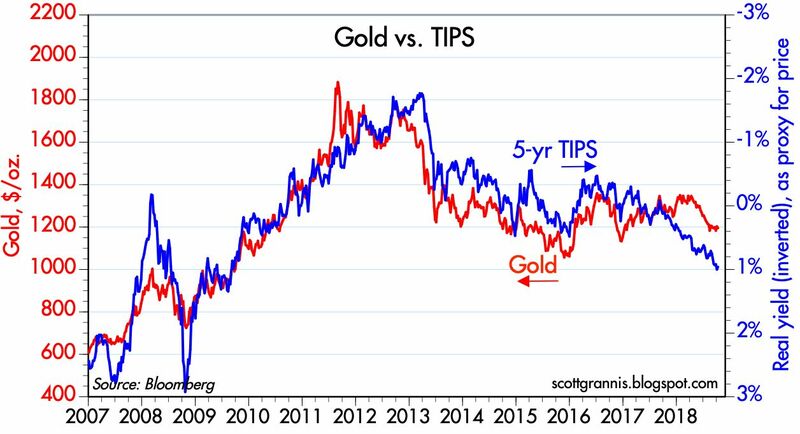 Confidence is replacing risk aversion, and with rising confidence comes less demand for the safety of gold and TIPS. This is healthy. Chart #4 shows a popular measure of the dollar's value against other major currencies. By this measure, the dollar has been roughly flat for almost four years. Problems usually arise when the dollar experiences big moves up or down, since that can and often does reflect big changes in monetary policy (tight money tends to strengthen the dollar, and vice versa). 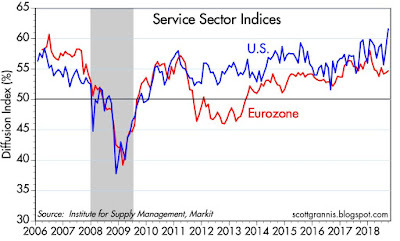 This is a good indicator that US monetary policy is not causing significant problems for the rest of the world. 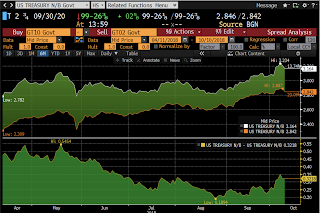 Chart #5 shows the real and nominal yield on 5-yr Treasuries (blue and red lines) and the difference between the two (green line), which is the market's average expected rate of inflation over the next 5 years. Note that inflation expectations have been relatively stable around 2% for quite some time, and especially over the past several months. This means that nominal and real yields are rising and falling by about the same amount, which further means that what is driving the ups and downs in interest rates is changes in real yields. 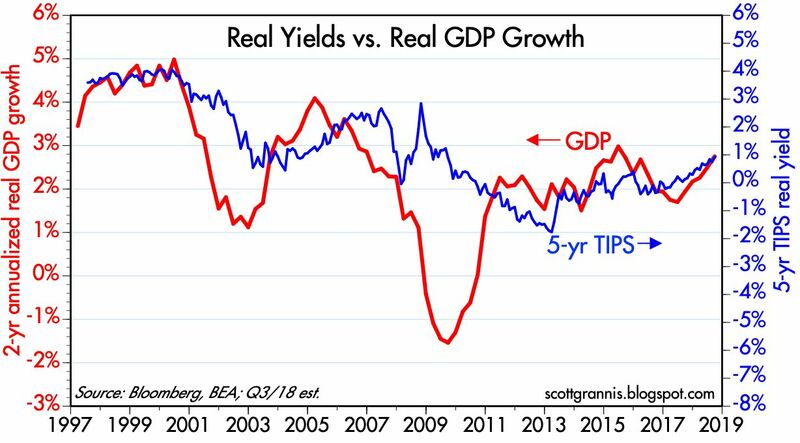 As I've noted many times before, real yields have a strong tendency to follow the real growth trend of the economy. 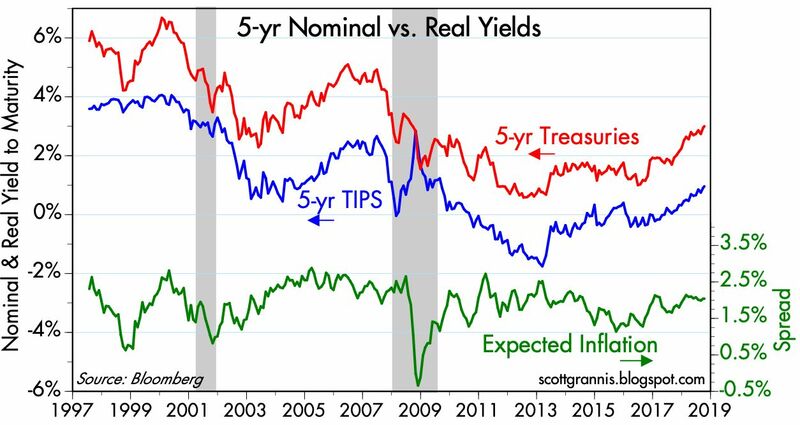 Real and nominal yields are up because the bond market is becoming more optimistic about the health of the economy. Nothing at all wrong with that! Chart #6 compares the real yield on 5-yr TIPS (inflation-protected securities) with the real Fed funds rate, which I calculate by subtracting the year over year change in the core PCE deflator from the nominal Fed funds rate. The real funds rate is the best measure of how "tight" or "easy" monetary policy is. 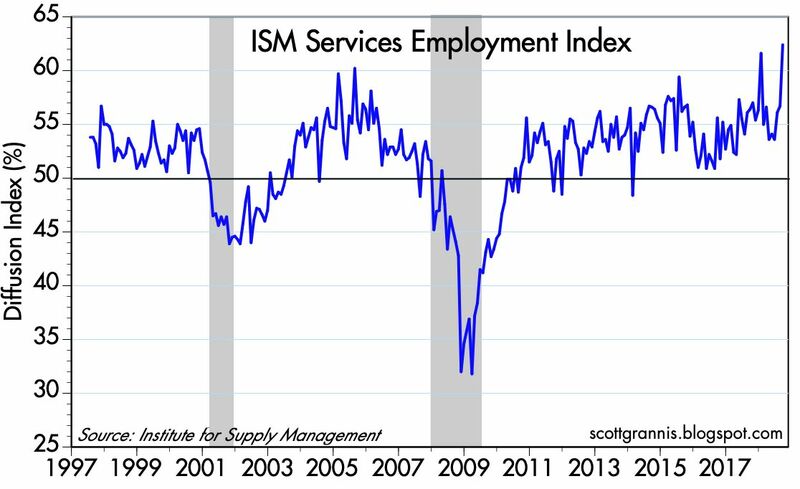 What this chart shows us is that over the past few years the Fed has moved from being very accommodative to now roughly neutral. This is not threatening, especially considering the improving health of the economy. In truth, what would be very worrisome would be if the Fed had NOT raised rates, since that would have given us a weaker dollar and rising inflation. Chart #7 shows the evolution of the slope of the Treasury yield curve between 2 (orange) and 10 (white) years. Nominal yields are on the top portion of the chart, while the difference between the two (the slope of the curve) is shown on the bottom portion. Note that the curve has been steepening for the past two months. This is prima facie evidence that the Fed is NOT too tight. Instead, it tells us that the market is expecting the Fed to continue raising short term rates modestly. If the Fed were too tight, the curve would be inverted, and that would mean the market was expecting the Fed to have to cut rates. 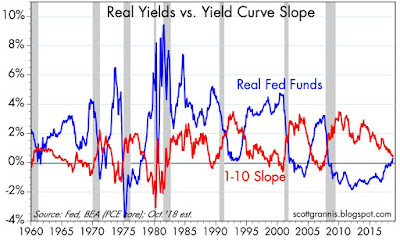 There's nothing scary about the current shape or slope of the yield curve. Chart #8 shows Credit Default Swap Spreads for investment grade and high-yield corporate debt. These are highly liquid and reliable indicators of how concerned the market is about future corporate profits (the lower the better). While spreads have increased a bit of late, this is a mere blip from an historical perspective. 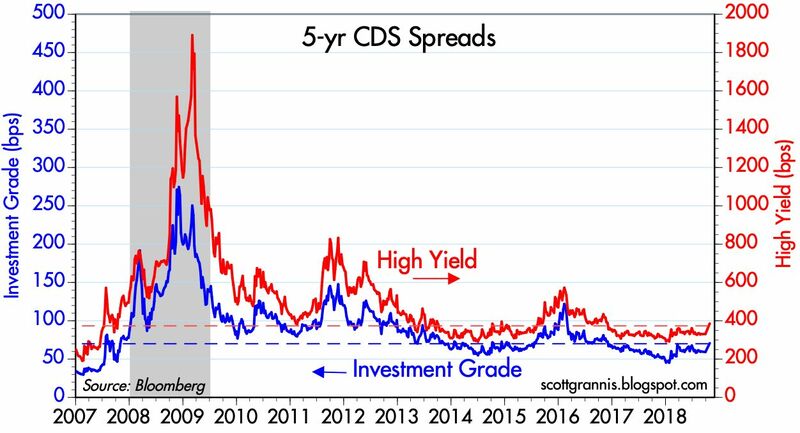 Credit spreads are still relatively low, which is another sign that the market is not very worried about the health of the economy. We likely will learn more about what sparked the current panic attack in the fullness of time. But for now, it looks to me like it's just another one of those unpredictable—and disconcerting—reversals that occur from time to time. Market are like that. Things should get back on track eventually, because there is no sign as of now of any serious deterioration in the market or economic fundamentals.